For most people, September is symbolic for back-to-school and many other new beginnings. Those of us who work in the industry, it stands for fashion month which translates to the first day of the rest of the year. Not only is it one of the most exciting times of the year, it’s also the only month that buying any American fashion magazine actually matter. Everything has a new sense of resolve and purpose that has far more meaning than any January resolution. As grown-ups, the brand new pencil case and shiny new pair of school shoes that signal a fresh start — are replaced by the new season updates that we hope will deliver much more than just the latest looks: from the mannish overcoat, to that uplifting new shade of lipstick. Inspiration for change presents itself in many places, whether it might be to revamp your sense of style, or simply given a chance to encounter an experience that is all we need to gain new perspective. Which is something we actually have the opportunity to do during our summer happenings. Thinking back to our school days, the thrill of discovering something ‘brand new’ holds much promise. It’s the same idea with a new season full of covetable fashion lying in wait, there is certainly satisfaction to be had on the sartorial front. Many of the designers looked to the past, dipping into some of the most good looking moments from decades gone for inspiration. There is a sense of romance and freedom summoned up by the silhouettes and palettes of the 60s and 70s, but also the power and glamour of the 80s, the simplicity and clean lines of the 90s. These eras were each filled with game changing moments that heavily influenced fashion. Today, designers have and continue to give a different twist on classic pieces for the woman of now. Marc Jacobs fist t-shirt, H&M Trend full denim skirt, Birkenstock Arizona leather slides, Alexander Wang Racketeer satchel, Super sunglasses, PORTER magazine. Thankfully, issue four of PORTER magazine has been helping me prepare for fall. Once you pick up a copy from your local newsstand, you’ll discover, everything you need to hit fall feeling polished and modern with their guide of all-important beauty and wardrobe essentials. 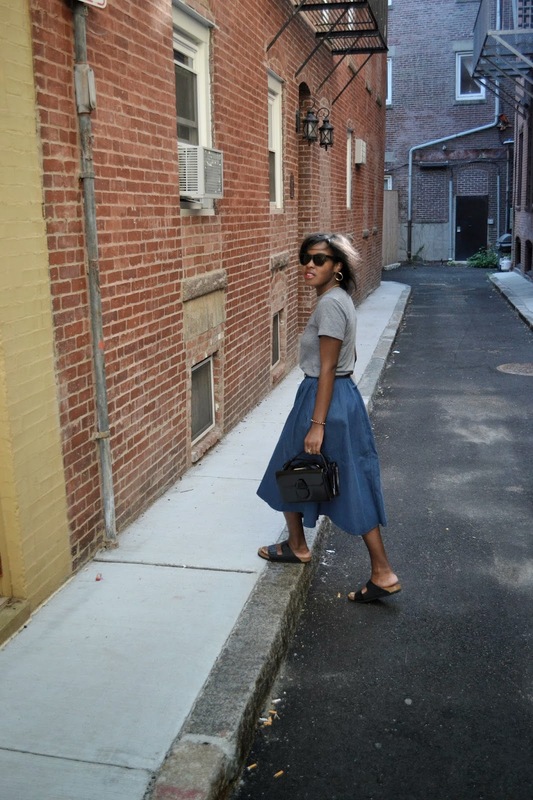 As of late, I’ve been resorting to the easy staples such as — that one t-shirt you wear more than once in between washes, a full skirt, and Birkenstocks to get through the rest of the warmer days. It’s a very interesting experience sweating perfusely while out shopping for the season ahead.